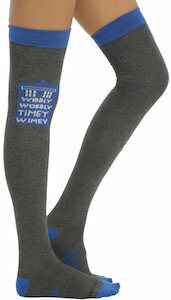 If you want some fun knee socks for under a skirt, shorts or dress then these Doctor Who socks is what you need. These socks come till above the knee and are dark grey with a blue band at the top, heel and toes and just under the knee there you find the Tardis and on it you find the text “Wibbly Wobbly Timey Wimey” just like the 10th Doctor once said. Doctor Who socks like these are just great fun to have and specially for a true Whovian like you that just hates having cold legs and want to look great. 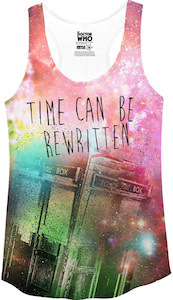 This Doctor Who tank top is fun and perfect for all the female Doctor Who fans. The tank top shows a colorful print of a galaxy far far away on both the front and the back. And on the front of this shirt you can find a black and white image of the Tardis with above it the text “Time can be rewritten”. 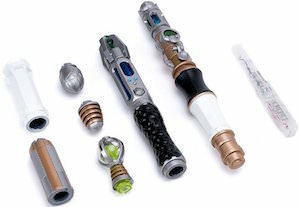 As you can travel in time and space with the Tardis it is clear that you can change time and the Doctor always makes it clear that he does not like to change time but it does happen. Come and select the perfect size of your next Doctor Who tank top so that all your friends can enjoy it when you wear this amazing top. Money needs a nice place to live between it gets to you and you spend it in store. This Doctor Who wallet could be the perfect spot for you money and cards. This bi-fold wallet is blue on the inside and on the outside you can see the Van Gogh painting of the exploding Tardis. So this wallet has a lot of color witch makes it perfect for you and it will remind you about the 11th Doctor and Amy and the fun adventures they had including the one that they had with Vincent Van Gogh. 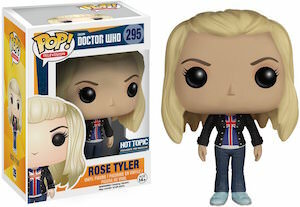 Now that many Doctors came and went you have to think back at the one it all started at Doctor Who number 1. Now you can enjoy your morning coffee and afternoon tea out of a mug that looks just like the 1st Doctor. 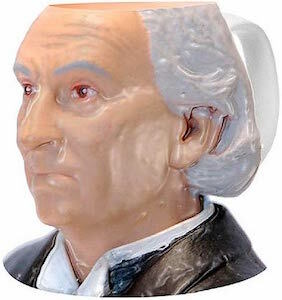 This bust mug shows the famous face of the first Doctor Who and this mug is about 4 1/2 inch tall and just perfect to drink from. Now you will always know about the Doctor that started it all as he will be there to keep your favorite drink ready for you to enjoy. Do you toes fight in your socks? If they do then you need this pair of Doctor Who toe socks because then every toe has it’s own space and that will stop your problem and keep every toe nice and warm. These Doctor Who socks are light grey with blue stripes going from the foot all the way up witch makes them nice looking. But to make these socks perfect Doctor Who material they put images of the Tardis on each toe so there are 10 images of the Tardis. 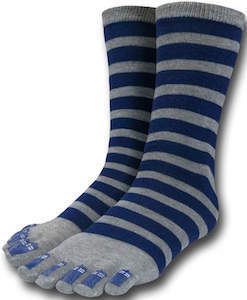 These women’s Tardis socks will fit sizes 4 – 10 and yes the boys can wear them to if they want. 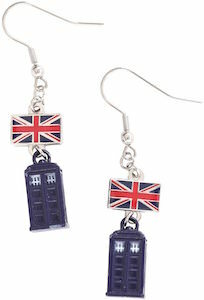 If you like Doctor Who and Great Britain then this pair of earrings is just what you need. The earrings are about 2 inch long and have the Union Jack flag on top with just below it the blue Police Box from the Doctor. This officially licensed Doctor Who jewelry is just fun to have hanging in your ears so that you get reminded about the Doctor and all it’s adventures and wearing these Tardis earrings will make others notice that you like Doctor Who. You new Doctor Who Tardis earrings come on a BBC card so that you know you are getting the real stuff. If you like Daleks and have some space on your wall then this poster is what you need. 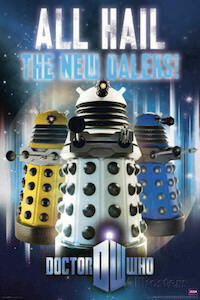 This Doctor Who poster shows 3 Daleks, in white, yellow and blue witch makes them look pretty cool but still an enemy of the Doctor. Above the picture of the Daleks it says “All hail the new Daleks!” and below the picture it shows the Doctor Who logo. The Dalek poster is 2 x 3 feet and is besides just as poster also available framed. Now you just need to make room in your home or office so that you and everyone visiting you can hail the new Daleks. Now you can feel a bit more part of the Doctor Who stories by simply wearing this Dalek beanie hat. 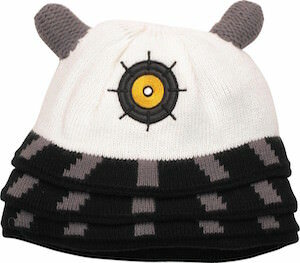 This winter hat is white with black edges and the eye of a Dalek and two antenna’s on top. So just put this hat on your head and you will feel like a white Dalek and are all ready to exterminate the Doctor and his friends. Besides great for a cold day this Doctor Who winter hat is also great as a costume part as it does change the top of your head into a Dalek.